Mick Ingpen’s Kipper and Wibbly Pig have been popular picture book characters for many years. Mick’s bold illustrations and simple story are winners with children and parents alike. However, it’s his latest creation, with daughter Chloe, that I fell in love with as soon as I set eyes on it. 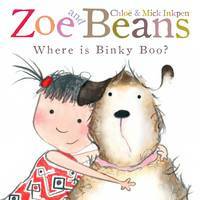 Zoe and Beans are the loveable duo that Chloe and Mick Inkpen have recently introduced us to. We’re introduced to the very cute Zoe and her loveable dog Beans in their first outing, Where is Binky Boo? Zoe loves her dolly, Molly, but so does Beans, ever since he lost his toy, called Binky Boo. Molly is the only toy he wants to play with, and when Zoe isn’t looking he takes it to show his doggy friends. But when Zoe washes Molly, Beans refuses to play with it. Beans is very unhappy, until they discover something ‘a little woolly something with a particular smell’ sticking out of the sandpit. 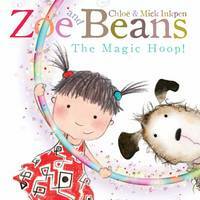 In The Magic Hoop, Zoe tries to get Beans to jump through her hoop, but Beans won’t have a bar of it. Zoe tempts Beans to go through the hoop using all his favourite treats, but when she throws Binky Boo through the hoop, the toy disappears. Beans jumps through to find his toy and magically turns into a rabbit. Zoe decides she doesn’t want a rabbit so makes Beans jump through again. Beans turns into a mouse, a crocodile and then an elephant! But elephants are big and the hoop is small. Will Zoe be able to get Beans back to normal or will he be stuck as an elephant forever? Their most recent adventure was Christmas themed. 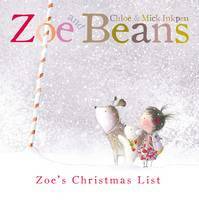 In Zoe’s Christmas List, Zoe and Beans travel to the North Pole to deliver her letter to Father Christmas, and meet a cute, fluffy friend along the way. Their next adventure (due out in June 2012) is called Pants on the Moon and sounds fantastic! The illustrations are gorgeous and the stories are that rare blend of both cute and funny. Zoe is brimming with confidence and a love for adventure that children can relate to. Children will beg for them to be read again and again, and I’m sure parents will be only too willing to. Perfect for reading one-on-one or as a read-aloud for groups (a particular favourite at my library Story Time).